Nearly 2000 Florida truck drivers have been warned that they will lose their CDL’s unless they retake their commercial driving skill test by January 19, 2016. 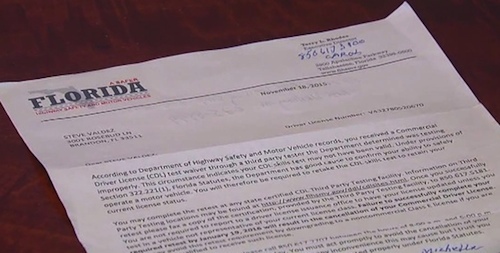 In November, the Florida Department of Highway Safety and Motor Vehicles sent letters to 1997 commercial drivers license holders informing them that the skills test they had previously passed to obtain their licenses may not have been valid and its basically on them to correct the situation or their CDL will be cancelled. Not surprisingly, many of the affected truck drivers are not pleased. "I've been running around out there with a truck for almost three years and I never had an incident. And all of a sudden you're telling me I've got to retake my skills test? I can't drive a truck anymore?" says Doug Cowell. “We did everything we're supposed to. Now we're going to have to test again, plus you're going to have to spend all the money again,” adds Timothy Johnson. Johnson operates Atlas Trenching in Port Orange, Florida and says that in addition to the expense and hassle, all the drivers trying to get re-tested by the January 19 deadline has caused a major backlog and he’s had trouble scheduling appointments for his employees. “You call every one of them, and they're all backlogged,” said Johnson. Perhaps the worst part is that the decision to re-test drivers was because of a man who was arrested in July for allegedly helping Russian truck driving students fraudulently obtain commercial drivers licenses. The FBI had arrested Ellariy Medvednik and three accomplices for operating a fraudulent commercial truck driving school in Seminole County. Authorities initially accused one of Medvednik’s associates of helping students cheat on their written exams using covert communication equipment and that Medvednik had hired him to administer the skills tests to approximately 600 students. However, charges against the test administrator have since been dropped and Medvednik pleaded guilty to ID fraud charges in September. He is scheduled to be sentenced in January. While it is uncertain why the charges against the third party test administrator were dropped, the concern about the validity of his testing had the Florida Department of Highway Safety and Motor Vehicles decide that all drivers who used that particular test administrator since 2012 must re-test to maintain their CDL privileges. “This does not necessarily mean that the Commercial Driver License holder is unsafe to drive. DHSMV is required to enforce the safety of Florida roads pursuant to Florida Statute, and this is the only way that the Department can ensure that all drivers are tested properly,” said agency press secretary Alexis Bakofsky. But for someone like Steve Valdez, who is entering his 50th year as a teamster and has never had an accident, the handling of the situation seems completely unfair. He says that he wishes the state had reviewed his excellent driving record instead of threatening his livelihood. “We're being put through the ringer over this and all because somebody else is a crook. And if we lose the license, we lose our jobs,” said Valdez. Some actually will. There were 400 Florida drivers that fraudulently obtained a CDL in the news recently because of one corrupt worker at the DMV. Those affected have 60 days to retake their tests or they lose their fraudulent licenses. Yea why dont they stop been corrupt and stop leting jb hunt and swift give away cdls to any idiot that can put the truck in 1st gear?????????? With no proper training? I wonder how many if actually tested correct for backing ? Will fail ? It's not true. I called the state dept. Myself and this is inaccurate information being posted. Please erase this post or i will report this. Edit your fraudulent post or get reported. Lol not worried at all!! I'm a card caring professional!!! I got this!! !